Hollandia draws players from the area designated as Zone 2 by Saskatoon Youth Soccer. 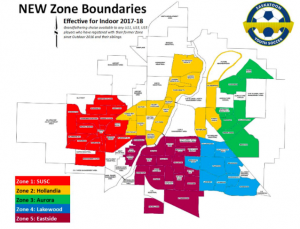 Zones were created to attempt to balance the number of players available to each club in the city. Note: U7 and U9 players, as well as U19 players born in 2000 or 2001, are not bound by zone restrictions and may register in any zone. U19 players born in 2002 or 2003 are still bound by zone restrictions.